Dr. Marianne Gilchrist [docm @t silverwhistle.free-online.co.uk] of Fife, Scotland, is interested in tracking down the source of the 'Wicked Lady' Kate Ferrers of Markyate Cell story which inspired the novel and film of the 1940s. (17C lady who disguises self as man and becomes a highway robber) I have seen suggestions that she is the Catherine Ferrers who m. Thomas Fanshawe of Ware Park (1632-74, later 2nd Viscount Dromore) in 1648, and was buried at Ware in June 1660. This Catherine or Katherine was born c. 1636, the daughter of Knighton Ferrers of Bayford and his wife Catherine Walter. She died without issue, aged about 26, and her husband married again. However, this Catherine is described in her husband's 'Dictionary of National Biography' entry as "a very great fortune and most excellent woman" (though this might be the family covering for her!). Also I have not seen anything to connect her with Markyate Cell. I should be grateful for any verifiable information about the inhabitants of Markyate Cell in 17C, or about Catherine. I am starting to have a sneaky suspicion the story may be a piece of 19C romantic mythmaking, but would like to know more either way! The story of the Wicked Lady is well-known and a recent retelling is in the book Tales of Old Hertfordshire. However one always has to be careful about such an account - as I am sure it has grown with the telling, and most of those retelling such stories fail to give sources. If I was researching it myself I would look in Chauncy (published in 1700) or the Victoria County History and if these proved a blank I would check to see if there was any parish register information, starting with familysearch. From that point I would check in the Hertfordshire archives (at HALS) both for relevant manuscripts and also in their local studies library for 18th/19th century books which might contain references which might help date the myth - if that is what it is. I might also check the St Albans City Library - which has a large (locked) collection of older books on Hertfordshire and the British Library. I suspect that the answer will mean a lot of hard work - mainly in Hertfordshire records. Dr. M. M. Gilchrist replied: Thanks for your tip-off. I consulted Page's Victoria County History of Hertfordshire, and have come up with some interesting findings re: the possible identity of the Wicked Lady, if she existed! Markyate Cell was from 1596 to 1640 the property of Sir John Ferrers, who married Ann Knighton of Bayford. Sir John's son, Knighton Ferrers of Bayford, who was married to Katherine or Catherine Walter, died shortly before his father in 1640, and the estate passed to his only surviving child, Katherine (1636-60) - the girl who in 1648 m. Thomas Fanshawe of the Ware Park family (later 2nd Viscount Dromore). Young Katherine d. without issue in June 1660, and was described as "a very great fortune and most excellent woman". *But* the Fanshawes sold Markyate in 1655 to three Londoners, who sold it again in 1657 to Thomas Coppin. Since this was *before* the death of Katherine Ferrers/Fanshawe, who lived in Ware, she cannot be our girl. However, there are hints that, despite having several estates, the Ferrers had some problems (after all, there was a Civil War going on!). Page (vol. 3, p. 421) tells us that Knighton Ferrers mortgaged his maternal estate of Bayford to Edmund Knight in 1638, and on his death 2 years later, the debt was left to his widow, and thence to his daughter Katherine. Again in 1655, the Fanshawes (who had suffered sequestration as Royalists) conveyed Bayford to one John Mayo. 1. The legend of the Wicked Lady is simply a 19C romantic legend invented to explain the discovery of the hidden chamber in the thickness of the projecting chimney at Markyate Cell. Page describes it (vol. 2, p. 190) as being accessible by a circular stair from an opening over the chimney piece in the room over the kitchen. Page says that it had been found, presumably during the renovation of the house in 19C - he gives no date - and then re-sealed. 2. She is Katherine Walter, the widow of Knighton Ferrers and mother of the Katherine more commonly associated with the story. I have not so far ascertained her date or place of death, but as a young widow in time of civil war, she might be considered to have motive and opportunity to augment her finances in an irregular fashion! 3. A third possibility, of course, is that it *is* Katherine jnr (1634-60), wife of Thomas Fanshawe, but she didn't work out of Markyate, and didn't die there! After further rummaging, with help from John Barber it seems it's probably an early 19C romantic myth: a combination of an 1833 poem, 'Maude of Alingham', with the discovery of the secret room at Markyate in the mid-1820s, 19C speculation over Kate's untimely death, and a name-transplant from 'Wicked Lord Ferrers' (no relation) who was hanged in 1760 for killing a manservant. (The murder of a faithful old retainer figures in the novel and film versions of the legend.) The Fanshawes had sold Markyate Cell in 1655, so she's unlikely to have been hanging around there in 1660. Our Kate was also untitled at the time. Her father-in-law, Thomas Fanshawe snr. of Ware Park, was still living when she died. The Fanshawes didn't get the Viscountcy of Dromore until the Restoration in 1661. So it looks as if we're dealing with a folklore motif (18C popular balladry was rife with women disguised as sailors, soldiers, highwaypersons, &c.) that has attached itself to some real people. A possible reason may be that Thomas Fanshawe's *mother*'s maiden name was *Alington*, which may have got muddled with the poem. I have read one popular account which gave the 'Wicked Lady''s first name as Maude, which is clearly derived from the poem. The possibility that it was the mother is ruled out by the fact that Katherine Walter, widow of Knighton Ferrers, died young in Oxford in 1642. She had by then married as her second husband Simon Fanshawe, which is how her daughter from her first marriage came to be married off into the Fanshawe family at the early age of about 14. (I think Simon is Thomas jnr. 's uncle). Anyone for a 'Kate Ferrers is Innocent' campaign...?! For those interested in the legend, rather than the genealogy, Dave Trouser (davetrouser @t xenonet.co.uk) writes: You might like to visit the Wicked Lady pub in Wheathamstead, which is in No-mans land where the Wicked lady is said to have carried out hold ups. The landlord/manager there knows a fair bit about the legend (the pub is obviously named after the legend!). I can't recall his name, but he's the one with short grey hair and a beard. I have just seen (rather belatedly) the excellent article entitled The Real Wicked Lady by John Barber in Hertfordshire Countryside (July 2002 issue). 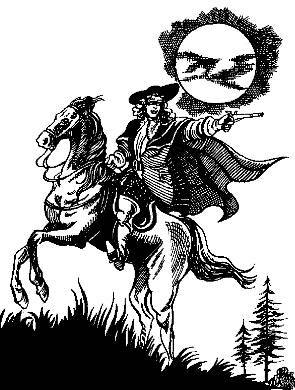 It provides further additional arguments for why there is no foundation in the legend that Katherine Ferrers was a highwayman. A modern version of the legend which fails to make it clear that it is an unsubstantiated myth.